Car Insurance is NOT the same starting July 2017... Good or Bad ??? From July 1 onwards, the premium rates for motor comprehensive insurance will be liberalized where premium pricing will be determined by respective insurers and takaful operators. In summary, it's based on flexible pricing mechanism. The aim of the liberalization was to gradually move the tariff towards pricing that was more equitable to take into account broader risk factors and reduce cross-subsidisation across business classes and risk groups. What are the factors included in determining the premium? Dubbed as the 'money game country' currently, Malaysia is famous again for the wrong reason. Why these kinds of money game schemes lingering around in Malaysia and attracted so many people to join? And, do we really know how to identify a so-called 'investment scheme' was actually a money game? 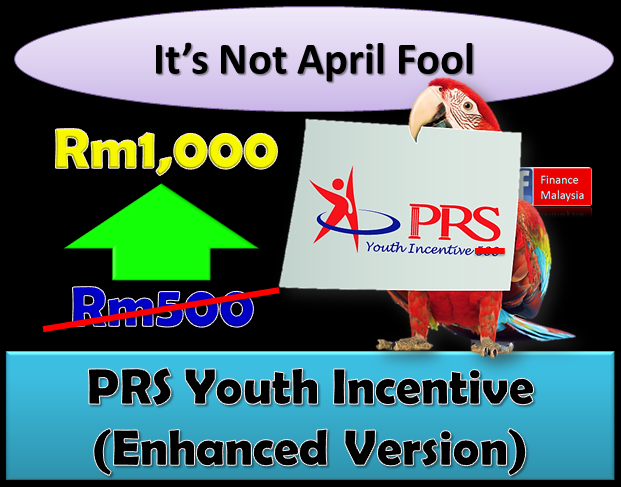 RM1,000 PRS Youth Incentive (Enhanced version)... It's not April Fool !!! Enhanced Version with 100% *Guaranteed Return?? ?